Bullying is a hot topic in today’s schools. More and more students and parents are turning to cosmetic procedures to alleviate the pain brought on by bullying. The story of Nadia Isle, 14, a Georgian teen who underwent chin augmentation, rhinoplasty, and ear pinning procedures to stop her harassment, has sparked a debate. Nadia’s story garnered a lot of media attention. In response to this attention RealSelf.com created a survey to look at whether or not parents think it is acceptable for their teens to augment their appearance to avoid being bullied. 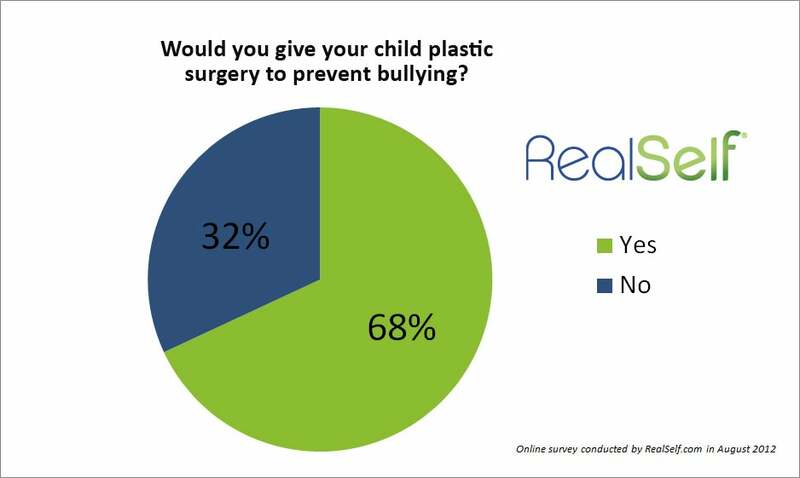 68 percent of parents polled were in favor of allowing their child to undergo a procedure to combat bullying. 32 percent were against cosmetic procedures for their child. 24 percent stated they would consider nose jobs and ear pinning procedures as appropriate options for teens if it meant the bullying would be alleviated. According to the American Society for Aesthetic Plastic Surgery, in 2011 people under the age of 18 amounted to around 1.4 percent of the total cosmetic procedures performed. The next age group, 19 to 34 year olds, amounted to 20 percent of total cosmetic procedures. The most popular procedures for teens to undergo are laser hair removal, acne laser treatments, and light skin treatments. Before undergoing any procedure it is extremely important, whether a teen or an adult, to do research into the procedures under consideration. In addition to doing online research, speaking to a medical professional is the best option.